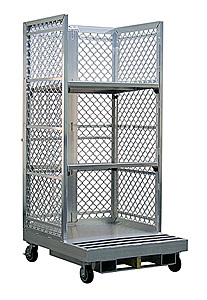 This all aluminum order picking cart with lift pockets has two adjustable shelves and heavy-duty welded construction. Universal lift pockets accept all Toyota order picking lifts. 32" deep shelves are contained within expanded mesh aluminum side enclosures to retain picked items. Cart rolls on 6" wheels with (2) swivel with brakes and (2) rigid platform type casters that respond superbly to turns and bends. Shelves adjust at 4" increments. Deck height is 4-3/8"H.